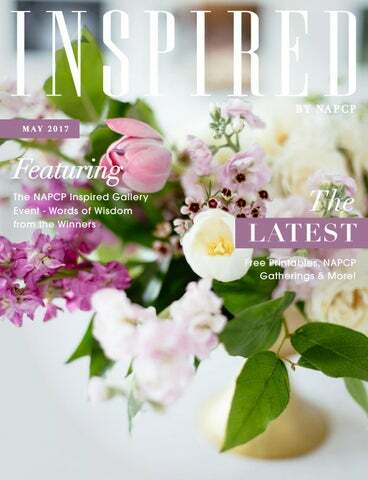 LATEST Free Printables, NAPCP Gatherings & More! The days are getting longer and the sun is shining brightly. Summer will be upon us soon! by NAPCP Gallery Event print competition! Our deepest gratitude to all who entered prints, to our judges, and to our delightful sponsors. The winning gallery is now available on the NAPCP website for your viewing pleasure. around the globe over the next few days. Members and friends of NAPCP will be coming together for an energizing photo walk, and we will be featuring some of our favorite images across NAPCP media over the coming weeks. If you missed the March Gathering, make sure you attend your local May Gathering -- it is sure to be incredible! the NAPCP Store for a complementing fine art print! If, like us, you firmly believe that April showers bring May flowers, you will want to spring into the lovely crepe paper flower tutorials created by our talented Lead Designer especially for you. Bookmark the site so you can print your June calendar as soon as it’s live! NAPCP Member Community Facebook Group each Monday, and we have some special guests for you this month. We’ll be there with our coffee in hand! a magnificent print! Across the Inspired Gallery Event themes of Light, Motion, and Wonder, these photographers entered their imagery into our very first print competition. The prints were on display at the Gallery Event Reception held at Park Studios in Atlanta, where the winners were announced in person and memories were made and tears of joy were shed. We interviewed some of the placing photographers and you will want to absorb every bit of the inspiring words they have to share! Have a merry month of May! C L I C K H E R E T O G E T Y O U R S T O D AY ! Napcp Store Head on over to the NAPCP Store to check out the latest Fine Art Prints. Our prints are perfect for a variety of uses! Download, print and hang in your office, or include as a gift for clients with packaged orders. Totally up to you! Click here to get yours today! After much excitement and anticipation surrounding NAPCP’s first ever Gallery Event and print competition, we are positively elated to feature the winners of the Inspired by NAPCP Gallery Event. Winning prints were marked by custom ribbons for all who attended the Gallery Event Reception to see. As NAPCP continues to grow and thrive, one of the most crucial pieces of our organization is the celebration and promotion of our accomplished members. The digital International Image Competition is one of the many ways we do this, and we are extremely proud to add the Inspired Gallery Event print competition to the NAPCP competition repertoire. Continue on to see more of the stunning event! The inaugural Inspired by NAPCP Gallery Event Reception was held on the evening of Thursday, April 27th, at Park Studios. In contrast to our bi-annual International Image Competitions, the NAPCP Inspired Gallery Event is creative in nature and gives both members and non-members the chance to place in one of three categories. The categories for this event were Light, Motion, and Wonder. The purpose of this event was to provide an opportunity for NAPCP members and professional photographer friends to explore their creativity in new ways. Park Studios, which also hosts NAPCPâ&#x20AC;&#x2122;s new office, was the light filled scene of the visually stunning event. In the heart of Buckhead in Atlanta, Georgia, this studio and creative space was transformed to coordinate with and enhance the gallery prints submitted for the competition. photographers in their own right. The Inspired Gallery Event Reception celebrated the photographers and prints submitted by placing the entire gallery on display, and open to the public via a ticketed event. Many of the beautiful photos were custom matted and printed by our partner for this event, Musea Lab. All featured artists were invited to attend the Reception event, and those who were present enjoyed drinks and refreshment, and of course lively conversation! We encouraged everyone to truly take in the artistry that surrounded them! LAUREN SANDERSON | Let There Be Light | FIRST PLACE, Light Do you have any words of wisdom for photographers who haven’t entered into a print competition or gallery yet? Yes! Talk to other photographers about it, ones who have entered print competitions or had gallery events of their own. My friend Ashley Berrie recently had a gallery show and I mentioned to her that I wanted to pick her brain about the process. I’m about 2/3rds of the way through a year-long personal project and I’ve thought about showing a small collection of the images once I’m done with the project, but I had no clue where to even start. When the NAPCP Inspired Gallery Event was announced, she was thoughtful enough to tell me about it and I entered the same day. I know it’s not the same as having an entire gallery show, but just the process of selecting an image, editing it for print, and seeing the final photo displayed on a gallery wall has been incredibly helpful toward showing more work in print in the future. Above: Jennifer Kapala, Born in the Shadows. Carolyn Ann Ryan, Bedtime Blues. Kristin Fuller, Connected. AMANDA WINCHESTER | A Dream Of Childhood | FIRST PLACE, Wonder What is the draw, for you, to photography as an art form? Ever since I was a kid I’ve been drawn to photography. I think the first impact it had on me was through National Geographic magazines ... maybe just the wonder of things and people I had never seen photographed so beautifully (I would also say that Ansel Adams had an impact on me growing up). As an adult, I learned to love it not only for the purpose of capturing moments to remember, but doing so in an artistic way that evokes emotion from the viewer. I don’t draw, paint or produce any other type of art, so for me, photography is the perfect form to show people how I see them or how I see the world. The perspective of your winning image is especially memorable. Will you share what you look for in a shooting location? This photo was actually not taken on a planned shoot, but it was an ideal shooting scenario in a lot of ways. I was on vacation at the beach, and the girls in the image were just playing. We were in a beautiful place and they weren’t paying me any attention, there weren’t many people around. I love locations that can elevate the moment ... that may add something to what is happening between my subjects. The qualities of the beach really elevated this moment of play, and then my take on it made an otherwise typical capture of kids playing into art, in my opinion. Above: Karen London, Who Me? Ally Elliott, Wish I May, Wish I Might (attendee favorite). Above: Elizabeth Blank, Ebb & Flow. Jennifer Kapala, Joy! Thanks so much to those who joined us on April 28th for the morning of education! We had a blast with Liana Hall, and our minds were working hard. We were feeling wonderfully after the business and pricing intensive course, because it went from number crunching and goals to baring our hearts and making friends ... NAPCP is community! Itâ&#x20AC;&#x2122;s all about getting into the important stuff together. Make sure you catch our new Facebook Live segments in the NAPCP Member Community, every Monday! Take a look at some of our favorite behind the scenes images from the gallery event! Be sure to follow @napcp on Instagram to see photos from future NAPCP events! Those of you who have met Kristen Smith before know that it’s no secret she has many hidden talents. This month, we’ve asked her to share her secrets for creating beautifully realistic paper flowers. We love the way this tutorial turned out (and we know you will too!). For a full instructional PDF guide on how you can create your own amazing paper flowers, check out her blog post at NAPCP.com. Then, feature them as centerpieces at your next brunch, give to a friend, or use them as home or studio decor. Whatever you do, don’t forget to tag us @napcp and using #napcp when you display or gift your beautiful creations! NA P C P G AT H E R I N G S Join us (THIS WEEK!) for our second annual NAPCP Photo Walk! As creatives, sometimes we need to do something to re-charge our batteries and reset our minds. Take this time to chat with photographers in your area and enjoy experimenting and getting creative with one another. Donâ&#x20AC;&#x2122;t forget to tag @NAPCP and use the hashtag #NAPCPPhotoChallenge so we can see your work! Stories Within A Story: An Interview with Kathy Locke Recently, photographer Kathy Locke, of Child’s Play Photography, took some time away from her typical client sessions to photograph a dozen families whose lives were impacted by a nonprofit children’s social service agency, Baby TALK. Kathy was overwhelmed and overjoyed when her project came together as a month-long exhibition in a gallery, entitled “Stories Within A Story”. Kathy’s exhibit featured over 40 images accompanied by short stories about each family: their complex challenges, and triumphs. We were delighted to sit down with Kathy and chat about how this amazing endeavor turned into something more. Read more. Meet Kathy Locke: Kathy is a child photographer from Decatur, IL specializing in Timeless, Genuine and Expressive Fine Art Portraits of Children, Seniors and Their Families. #100DaysOfHimAndHer – Top 5 Reasons You Need to Start One It’s 2017, we all know what that means. A few months ago I was motivated to make some changes in my life. The new year is refreshing – a chance to make a difference in your life or challenge yourself in a new way. Over the last 6 years, I have written plenty of personal goals. Some fail and some succeed, but I have learned that the best way to gauge what kind of year you had as a photographer is by looking back at your work and seeing growth. Read more. Meet Deanne Mroz: Deanne started her own small photography business in 2010 and has a passion for photographing children and documenting life. Currently, she is working for NAPCP as the Design Production Assistant. # N A P C P I N S TA FAV E S Check out the feeds of these amazing photographers and make sure to follow along! For your chance to be featured, tag #NAPCP on Instagram. Directory on the site today! the link below for details!